Two brightly colored lions prance in, blinking their formidable eyes and deftly hopping onto poles to the lively beating of drums and ringing of bells. Tapped on the head, one lion jumps up into the air, rolls over and lands on two pole tops, each action cheered by the audience. Tumbling and prancing, the two lions grow fiercer with the bursts of applause. Another performer, wielding a martial arts staff, joins in as the performance by the Wang's Lion Dance troupe continues. 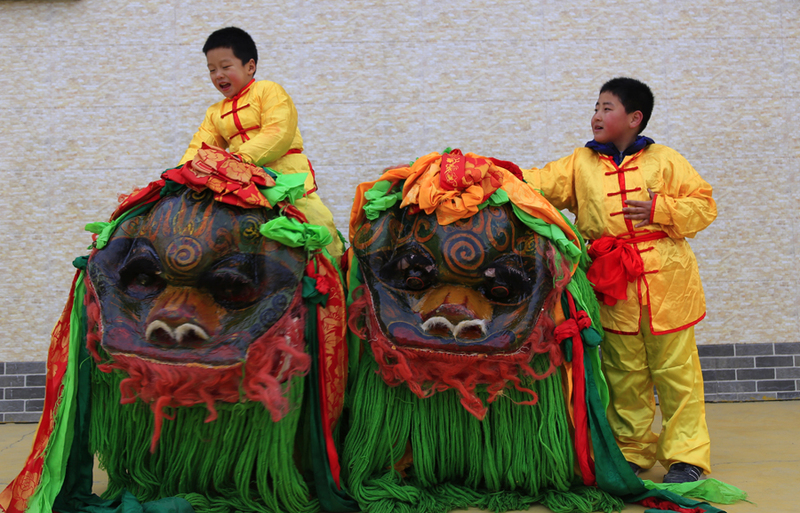 In Honghai village, in the Hongsibao district of Wuzhong, in northwestern China's Ningxia Hui autonomous region, the Wang family's lion dance techniques, passed down through the generations, are recognized as the best in the region and surrounding areas. 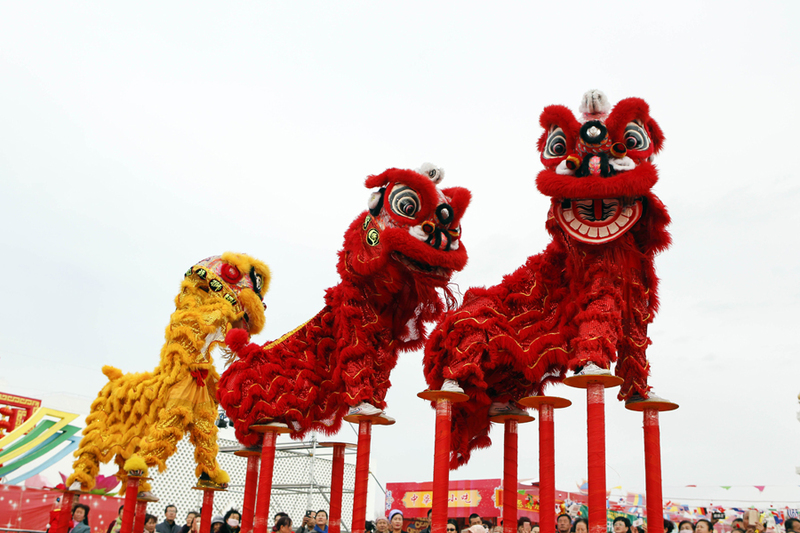 Traditionally viewed as a way of preventing disasters and seeking good luck, lion dances are performed widely in China and elsewhere in Asia, especially during special occasions such as festivals and grand events. Two performers mimic a lion's movements in a lion costume－one holding the head, another the tail. There are southern and northern styles of lion dance in China, varying in costumes, decoration and moves, with more martial arts element featured in the northern form. Wang Lin, 55, is the fifth successor of the family's lion dance. Its techniques have been passed down for over 100 years, beginning with his great-great-grandfather, Wang Baocang, late in the Qing Dynasty (1644-1911). When he was a child, Wang Lin started to practice lion dance under the guidance of his father, Wang Hanzhang, and his grandfather. "At that time, the elders were very strict and I would get punished unless my practice went well," he said. When the family moved to Hongsibao district in 2004, Wang Lin and Wang Hanzhang tried to rekindle the family tradition by buying new equipment and costumes and organizing children in the family and the neighborhood to practice lion dance. Wang Lin's three children still recall those workouts, when they practiced basic skills and various moves all day long. The soreness in their muscles not only honed their skills, but also ingrained lion dance into their lives. Because the Wangs' Lion Dance follows the northern tradition, performers should not only master various moves, but also martial arts weapons such as swords, spears and halberds. There are no shortcuts for northern-style practitioners. Take the part of playing the lion's tail as an example: the performer must hold on to the belt of performer playing the lion's head with one hand, and raise and sway the lion's tail with the other. Even during breaks, the performer needs to keep on interacting with the audience and constantly swing the tail, demanding a high degree of professionalism. However, things did not all go smoothly for the Wangs following their move to Hongsibao district, even though there was an upsurge in community interest in lion dance after their arrival. Lion dance was gradually ignored as children living nearby started school, and then later went off to seek work in cities. The advent of new technology such as television and the internet also outshone ancient performance arts. Performers and funding were hard to find, making it increasingly difficult to organize a proper lion dance. Things picked up for Wangs' Lion Dance in 2017, as China's rural vitalization strategy was implemented. Lifted out of poverty, Honghai village has gone through impressive changes and villagers are attaching greater importance to health and cultural inheritance than ever. Wang Lin now feels more confident about the future of Wangs' Lion Dance. "I am sure the stage will grow bigger," he said. "Performing lion dance can not only build up the body, but also pass on a positive living attitude. "As long as youngsters want to learn, I'll teach them myself. The heritage and the spirit should always be passed on." Over the years, Wang Lin was the lion dancer and his father the drummer. Now, they have retired to the audience, ready to give the stage to members of younger generations. Lion dance is still a compulsory course for family members, and the young generation put on a marvelous show at the 2018 Lantern Festival fire show in Hongsibao district. As a successor, Wang Lin said his family shoulders not only the responsibility to pass on the techniques, but more importantly, the spirit of the lion dance and its cultural essence. With the Lunar New Year approaching, his schedule became busier once again. He took out his phone and sent text messages to his children, who work in other parts of the country: "Come back home soon. We'll start to rehearse the lion dance for the new year!" Huang Chen contributed to this story.